Wachter Warehouse is an historic building located at the northeast corner of 5th Street and Front Avenue. 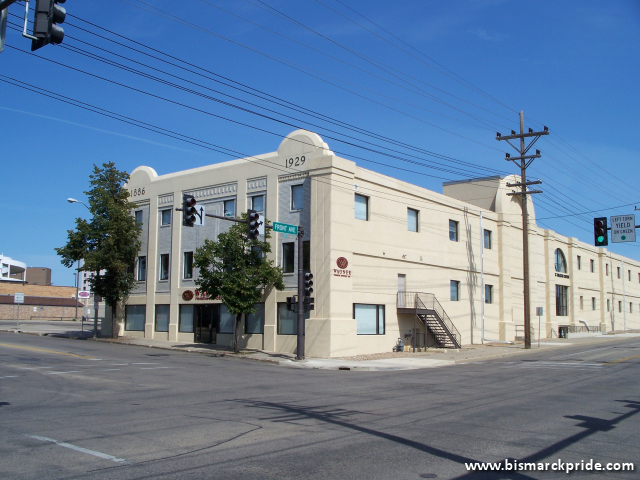 The building was built in 1929 as a warehouse for the Wachter Dray & Transfer Company. It later served as a warehouse for Winston-Newell Company and, until 1957, for Supervalu. In 1992, the former warehouse was converted into a muli-level shopping center called Time Square. The three-level mall was expected to house 14-16 tenants. Time Square housed five tenants at its May opening: A TCBY yogurt shop facing 5th Street, a women’s clothing store called Something Special, a lingerie store called Secret Moments, a hair salon called Difrentz Style, and children’s clothier Matty’s Kids. Burleigh County also placed a lien against the property for unpaid property taxes in 1991. Secret Moments also later filed – and won – a lawsuit against Time Square Mall for contractor fraud. A jury awarded Secret Moments $4,157 for being improperly charged an unreasonable amount to retrofit its store prior to occupancy. It also was awarded $15,000 in punitive damages. On the other side, it found that Time Square Mall did complete $4,293 worth of work, of which he was awarded in a counter-suit. A new group of investors acquired the mall in October, who planned $600,000 in improvements, including heating and cooling systems. By May 1993, owners announced an agreement with Workers Compensation Bureau to occupy the remaining portions of the mall. Today, the building houses Wagner Financial and Bismarck-Burleigh Public Health. In 1998, the Time Square name was revitalized, in an unrelated project, after the expansion of Expressway Plaza at 12th Street and Expressway.